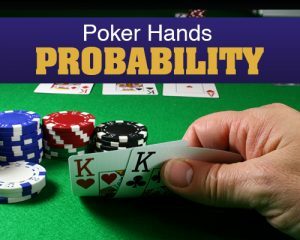 When calculating poker hands probabilities for a card game such as Texas Hold ’em, there are two basic approaches. The first approach is to determine the number of outcomes that satisfy the condition being evaluated and divide this by the total number of possible outcomes. The second approach is to use conditional probabilities, or in more complex situations, a decision tree. The probability of dealing a 7© would be1/52– There is one 7© in a deck of 52 cards. The probability of dealing any Ace would be4/52– There four Aces in a deck of 52 cards. The probability of dealing any¨would be 13/52 – There are 13¨ s in a deck of 52 cards. In fact, the probability of being dealt any random card (not just the 7© ) would be 1/52. This also applies to the probability being dealt any random value of card like Kings, tens, fours, whatever (4/52) and the probability of being dealt any random suit (13/52). The numbers change for future cards. The probability of being dealt a 7 for the first card will be4/52. The probability of being dealt a 7 for the second card will be3/51. After we have been dealt the first card, there is now 1 less card in the deck making it 51 cards in total. Also, after already being dealt a 7, there are now only three 7s left in the deck. Probability of being dealt two exact cards. Multiply the two probabilities together. Probability of being dealt Aª- 1/52. Probability of being dealt K«- 1/51. Now let’s just multiply these bad boys together. So the probability of being dealt the Aª and then K« is 1/2652. Probability of being dealt a certain hand. So, we want to find the probability of being dealt any Ace and any King. Probability of being dealt any Ace –4/52. Probability of being dealt any King –4/51(after we’ve been dealt our Ace, there are now 51 cards left). However, again with the 2652 number we are working out the probability of being deal an Ace and then a King. If we want the probability of being dealt either in any order, there are two possible ways to make this AK combination so we multiply the probability by 2. Probability of being dealt a range of hands. Work out each individual hand probability and add them together. Probability of being dealt AA –1/221(4/52 * 3/51 = 1/221). Probability of being dealt KK –1/221(4/52 * 3/51 = 1/221). The chances of getting a top starting hand (of double aces, picture pairs or A-K suited), is a minute 2.1%. If you’ve got a flush draw (one card short of a full flush) after the flop, you’ll make your hand 34.97% of the time. Don’t play any two cards just because they’re suited. It only improves your hand by 2.5%. Rarely worth drawing to, with the turn and river cards to come you’ll hit your gutshot straight (four outs) approximately 9% of the time. When two pairs go head to head, the bigger pair will win roughly 80% of the time (or four times out of five).